Snapshots, a few. Story in the works. 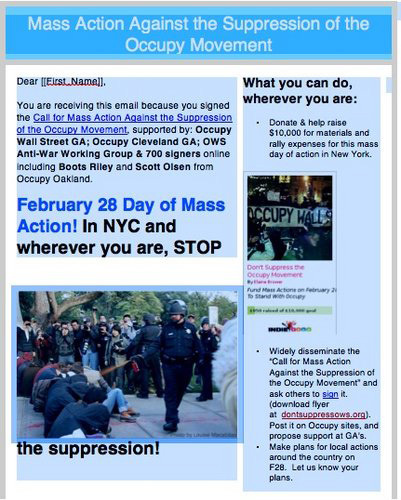 Support is growing for a non-violent mass action Tuesday, February 28 in NYC against the suppression and repression of the Occupy Movement, raising the demands, “Stand with the Occupy Movement! No Rubber Bullets – No Beatings – No Tear Gas – No Mass Arrests, Don’t Suppress OWS. Drop All the Charges Against Occupiers.” The General Assembly of Occupy Wall Street reached consensus February 11 in support of the Call for Mass Action Against the Suppression of the Occupy Movement, and specifically in support of the February 28 Mass Action at Union Square in NYC. This Is Happening Whether “They” Like It Or Not! Supported by: Occupy Wall Street General Assembly; Occupy Cleveland GA; OWS Anti-War Working Group & 700 signers online including Boots Riley and Scott Olsen from Occupy Oakland. The Atrium, Wall Street Area, Meeting With General Assembly, OCCUPY WALL STREET. Saturday, February 4, sometime after 7 p.m.
I’ve been working with an ad hoc group that wants to do a mass action rally against the blatant political suppression – via NYPD – of OCCUPY WALL STREET in New York City and the attack on the movement in general across the country. 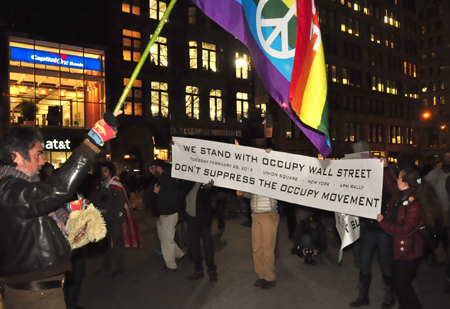 The purpose of the nonviolent rally is a quick infusion of visible energy and support to OWS in this time of crisis, to stir up the spirit of millions in the wake of the NYPD attack on Zuccotti Park, evicting OWS. I was concerned that though the spirt of OCCUPY is manifest, the NYPD eviction could be interpreted as a defeat for OCCUPY and that the movement has been thwarted. Members of the ad hock group believe that a quick response is necessary as a response to the police eviction. So, I was there in the Atrium with the ad hoc group seeking approval to move forward with the plans: An interesting experience for this writer who did not participate directly in the Zuccotti Park action. Most of the 50-plus GA members seemed generally supportive of what we wanted to do. There were at least four who didn’t and, based on the rules formulated by OCCUPY, one could block the support. And, of course, there were four.